The star dish of The Alpine Lodge, our homemade Cheese Fondue serving it with baguette & 100% beef cubes, Steak Frites, Garlic bread and Crudités. (Vegetarian options available). Prices from £11.00 per person (minimum of 4 people). This is great for team bonding, a family get-together or just an excuse to all have fun & eat. What more could you want? 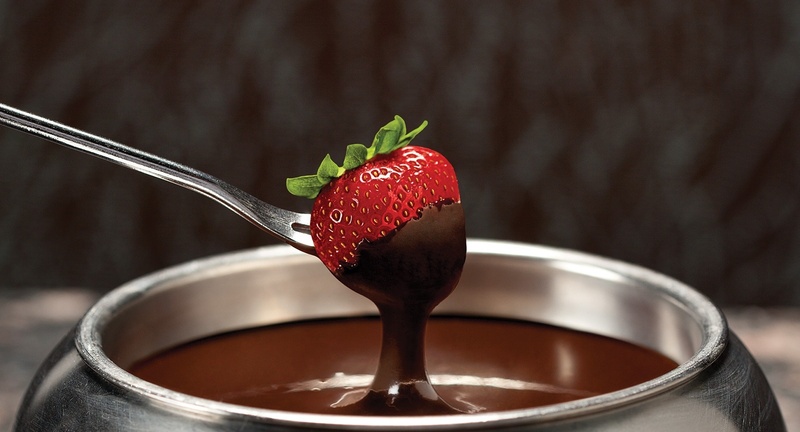 Our decadent 100% Belgian chocolate Fondue is one-of-a-kind, ready and waiting to be dipped with our assortment of fruits, chocolate, marshmallows and cakes. Prices from £11.00 per person (minimum of 4 people). Suitable ages from 8 with chocolate with 1 adult per 4 children & 16+ for Cheese. Why not combine your fondue with one of our activities; Choose from skiing, snowboarding, or Tobogganing & Sno-tubing! Vegetarian menus are available upon request. Please call us on 01752 600220 for more information.